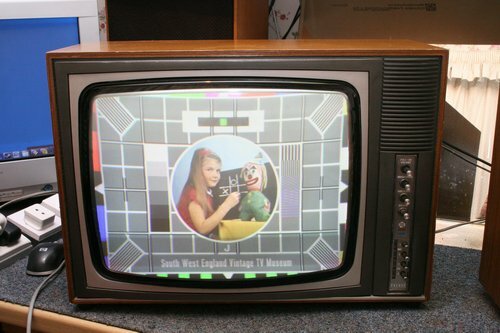 When the TV Museum is finally in it's new premises in Devon, these sets will all be on display properly. 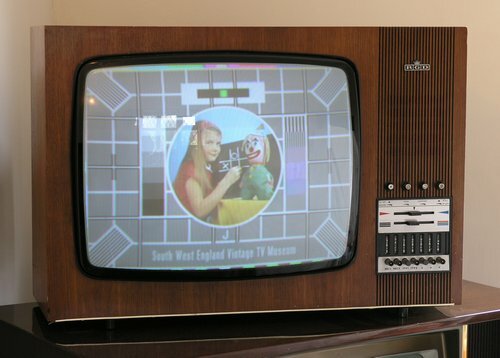 At the moment a lot of the sets are in storage, however, if you would like to see any of them in the flesh in Solihull, UK or if you have a pre 1970 colour set for sale, please email me at mike@tvmuseum.co.uk. 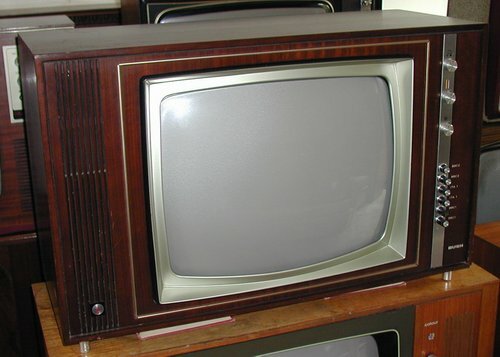 Click on the Quick-Links below to find a particular TV. Well, what can I say about this first set. It's a boring old Alba TC2319 using the boring old Thorn 8500 chassis :-) Actually, I only put the set in the gallery because of the "Evil Edna" face drawn in on the picture. (Thanks Lee.) I can't remember where the set came from, but I do love it really. :-) Shown in the picture are my mates Lee (left) and Tas (middle) and also myself (right). This first set was a model that I'd been after for many years when this one was extremely kindly donated to the museum by the excellent Steve Pendlebury from Lancashire. (See the "Links" page for Steve's site.) It is almost identical to the Murphy equivalent model CV1912 and it uses the same folded-up version of the Rank MK3 Hybrid Dual-Standard chassis. (See page 2 of the CTV Gallery for the Murphy CV1912.) When I say that the set uses the "Folded-up version" of the chassis, I mean that the standard chassis fitted to the 25" versions of the set was too big to fit in a 19" cabinet so they took the I.F. panel, turned it around 90 degress and then up-ended the decoder and mounted it parallel to the I.F. panel. It's a somewhat unusual arrangement but it seems to work fine. Click here for a picture of the circuit board layout from the Murphy version. (It's identical to the Bush.) Click here to change the picture back. This Decca CTV25 belongs to a pal of mine from London called Lucy. Over the years it has had quite a lot of restoration performed on it including replacing the old line-timebase section (the kind with a 25KV overwind and a GY501 / PD500) with the newer sort which uses a lower voltage EHT overwind and a tripler. The tuner buttons on this had completely seized up too, and freeing these was probably the worst job of the whole restoration. 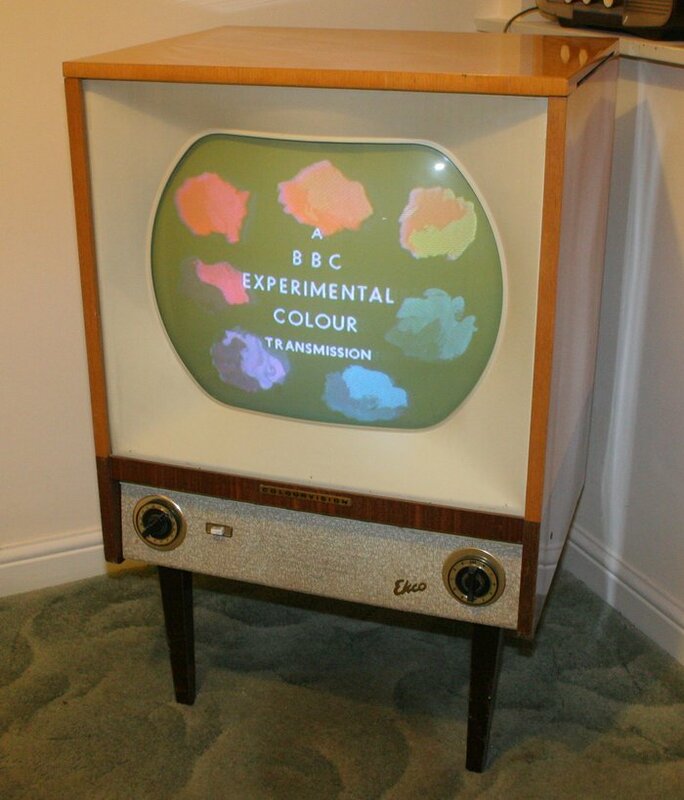 This next colour set is a 1958 (roughly) Ekco CT100M. I bought it from a great chap called Danny from Norwich for a small fortune, but it is a fantastic set and worth every penny that it cost my Barclaycard. 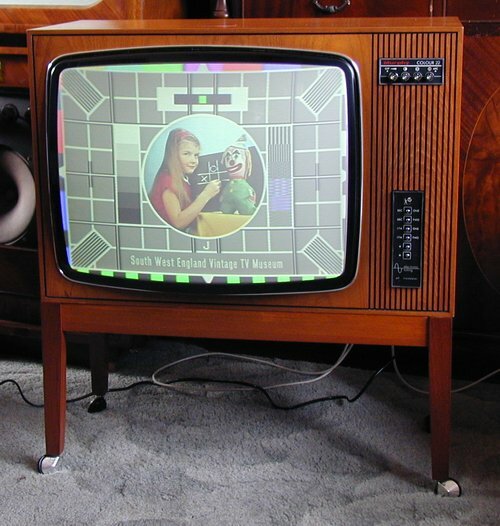 The set is an experimental colour receiver which was originally designed and built as a 405 line NTSC set, but was subsequently factory-converted in 1964 to 625 line NTSC and then again later in 1965 to PAL-S (Simple PAL). 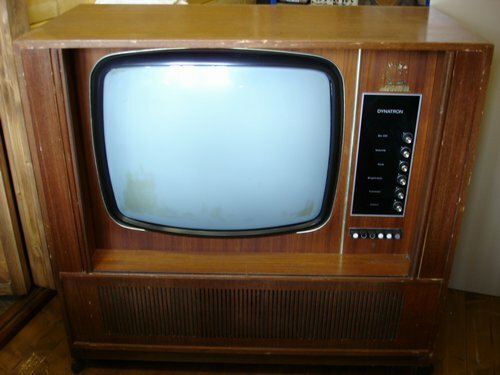 The cabinet is very typical of mid 1950s design and there are several different valve lists attached to the back indicating all the different design changes, although they're all stuck on top of one another so it is quite difficult to ascertain any real data regarding the modifications the set has had over the years. I have carried out a fair amount of electrical restoration and the set can now display a half-decent colour picture, but there is still quite a lot to be done to make the picture perfect. I'll post some more information and pictures of this set when I have some. This set is a Ferguson 3727 and it uses the Thorn 8004 chassis, which is a development of the earlier 8000 chassis. This particular set is in very good condition and looks like it has had very little use; the condition of the tube would also indicate its low use. These sets (and the similar 8000, 8000A, 8500, 9800 chassis sets) were pretty much unloved by the trade but I've never had too much to moan about with them, and this one is a cracker of a set. This next set is a GEC 2112 and came from a pal of mine called Tony in Exmouth. It really only needed minor adjustments to get it to go and it did have a very good picture until the tripler went bad and caused nasty fuzzy blurry lines all over the picture. I have a new (second hand) tripler to go in it, but I haven't had a chance to fit it yet. These sets were generally very hard on their tubes, but this one seems to have survived pretty well on its original tube. At least I think it's on its original tube. I guess this set is really a little bit modern for these pages but I thought I would include it anyway. 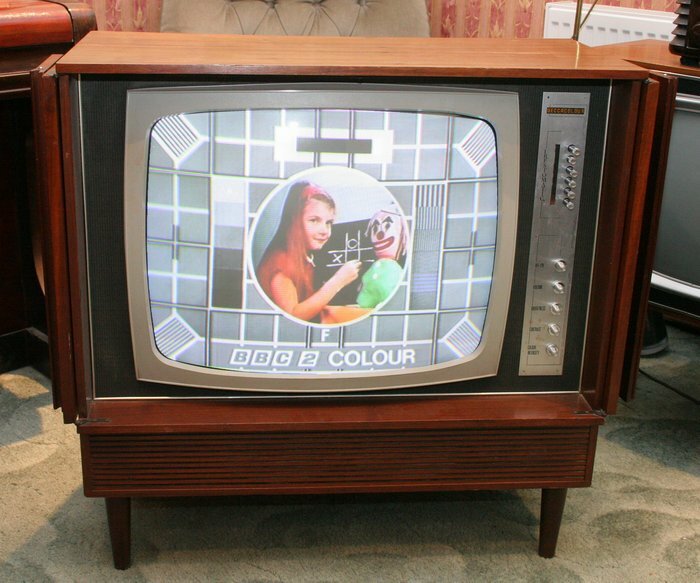 This set was the first colour TV we ever had and, despite having one of those awful Hitachi directly-heated-cathode type tubes, the picture is still first class. 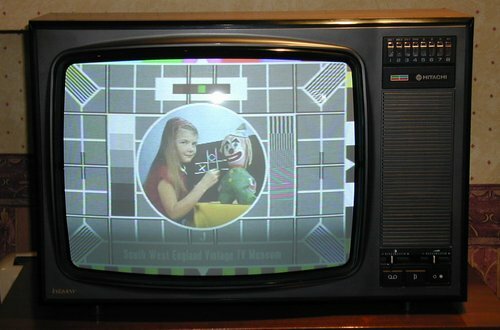 The benefit of this type of tube was that the picture appeared almost immediately the set was switched on; the downside being that the tubes never used to last very long at all. When you ordered a new tube for this set, Hitachi would send you an indirectly-heated version of the tube and a little modification kit. The set has only ever broken down twice - once when the boost capacitor went short circuit soon after we bought it, and again recently when the replacement boost capacitor went short circuit again. The company that initially repaired the set (Fords of Sidmouth) fitted a prehistoric Hunts Mouldseal capacitor in place of the original, so I'm very surprised that the set lasted as long as it did. 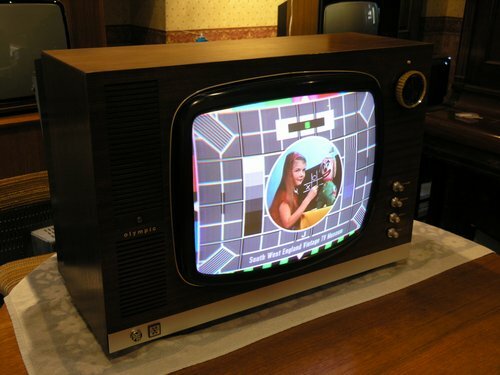 This next TV is a Hitachi CNP190. I never used to like these sets much but of late I've started to like them more. Hitachi sets were always very reliable (a lot more so than their contemporary British sets) and they seemed to go on for ages and ages. One problem these sets often had was the button and tuning assembly - The printed circuit carbon-tracks used to wear out and then the whole assembly had to be replaced (long since obsolete of course). This picture was taken at the museum down in Beaford. This is the Invicta version of the much loved (by me) and much hated (almost universally by everyone else except a few other brave or foolish masochists) Pye CT205. 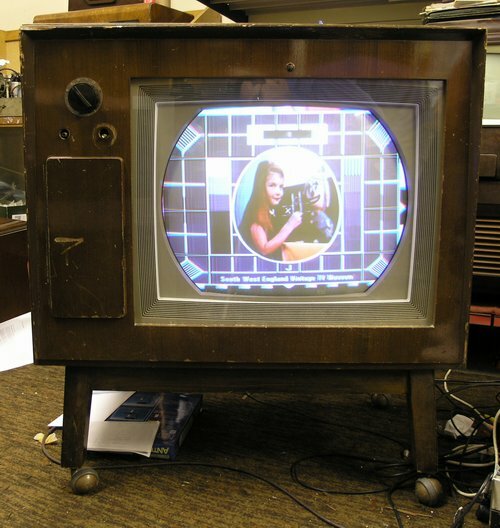 The Pye CT205 is one of those sets that started life as a cracking idea but really lost a lot in production. 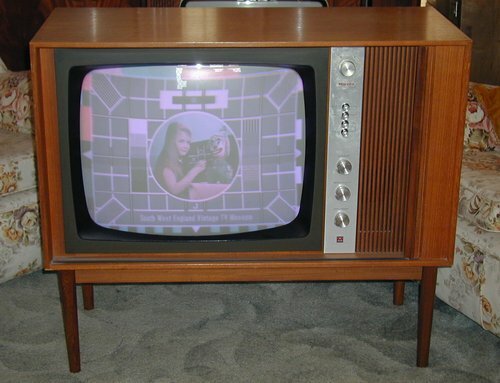 The Pye CT70, the set that used the original dual-standard version of this chassis was a masterpiece - well built, wonderful picture, excellent sound, and terribly reliable. Hmm, well, actually, it wasn't all that reliable but it was at least well built and had a good picture. Oh, and come to think of it, the sound wasn't all that good either, but you get the idea... 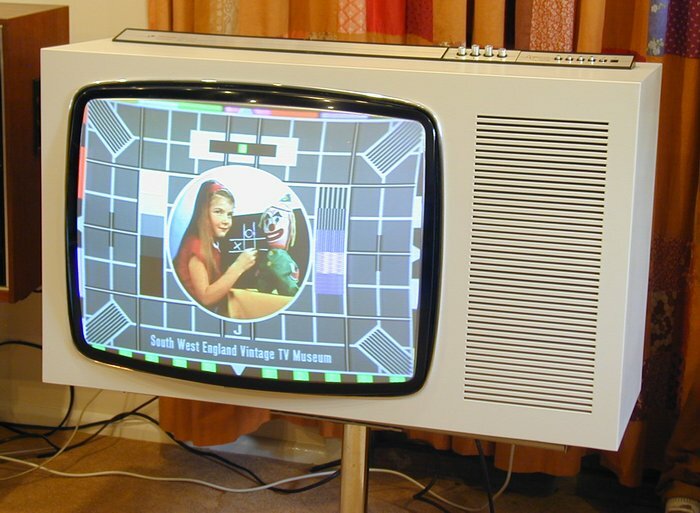 Anyway, by the time it had been hacked about and made into the much cheaper Pye CT205 / Invicta CT7052 etc., it had lost its 405-line capability, it had also lost any kind of EHT regulation, and this made the picture flutter wildly with transient brightness changes. But it wasn't all losses - It did gain a nasty printed circuit line timebase board which used to crack and cause all manner of faults, it also gained a horrible chipboard cabinet with plastic-wood that was glued on: the focus control and other plastic items now simply stapled to the inside of the cabinet, their over-use meaning that they would become detached from the chipboard and gracelessly fall inside the set. These sets, more than any other I can think of, had a huge pile of stock faults which did make them fairly easy to maintain, and, until a good few years ago, they could be found at recycling centres, jumble sales etc. on a fairly regular basis. I recently parted with this particular set and gave it to a mate of mine called Neil in South Wales as I already had the Pye version and I thought that having 2 was depriving some other lucky soul of some wonderful Invicta CT7052-shaped enjoyment. 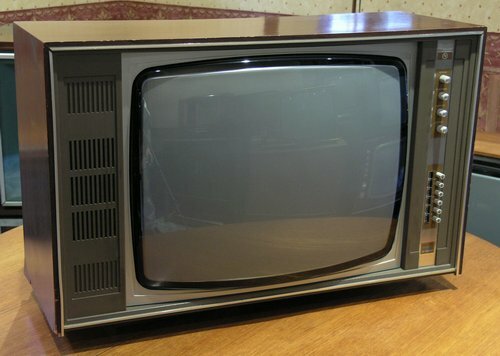 This is a Murphy CV2214 and is about as boring as TV cabinet design comes. This particular model came from an excellent chap called Colin who owned it from new and kept it in immaculate condition. Colin also modified it quite heavily, improving the set with a slow-start power supply, modified flyback blanking and RGB drives, and changes to the interlacing, which was never terribly good on these sets. The set uses the very common A823-AV chassis, a chassis which never really liked me very much and one which I never really cared much for either. 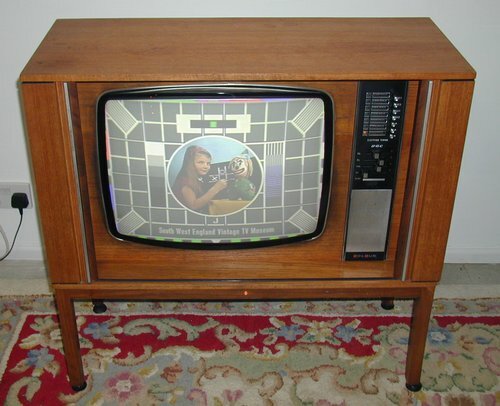 Even when new, the pictures on these sets could never beat the likes of the Philips G8 and the GEC solid-state chassis with which they were competing. They were usually very reliable though, although when they did go wrong, they weren't very easy to work on - some components (particularly in the timebase and EHT sections) are absolute swines to replace, and trying to work on the I.F. or decoder boards with the set running meant having to use special extension leads, which wasn't all that practical sometimes. Never mind, I do like this set a lot, and it's not required too much work on it since I acquired it. Thanks Colin. It's a smashing set. This is the trendy-looking Murphy CV2215 "Accoustic Deluxe". Despite its HUGE speaker grille, the speaker behind it isn't considerably bigger than the one fitted to the bog-standard model CV2214 (see above) but the sound is quite a bit more "rounded" than its more basic sister. This particular set came from a chap in London who very kindly donated it to the little museum in Devon. It required a little bit of work to get it to its current state, but now it is working properly, it's an excellent set. Thanks nice-man-from-London. 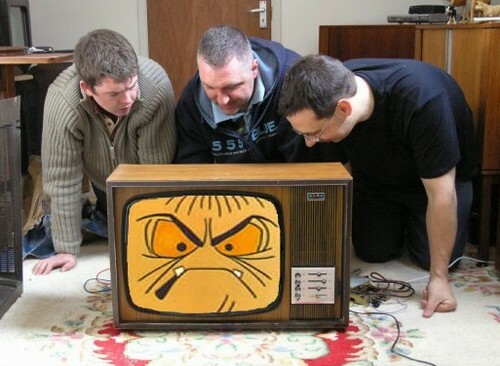 Addendum: In July 2011 the cabinet was damaged after a TV company borrowed the set and then sent it back via a courier without protecting it. A few weeks later, the cabinet was sent off down to a very talented chap called Mike Barker to be re-coated. The set came back later in the year looking like a brand-new set - It was a masterpiece of spraying. Thanks Mike. Well, here we have yet another Murphy colour set. Yawn. This is an older set than its Murphy siblings above, and it uses the slightly different A823 chassis (as opposed to the A823-AV chassis). 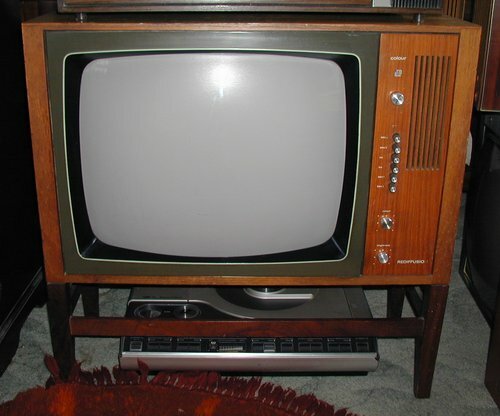 This set was wider than any other Murphy colour set of its era, a special extension-piece being attached to the back of the set as the back cover does not entirely cover the full width of the set. I bought this set from eBay, and went down to collect it from a good chap from Norwich, the name of whom escapes me. Thank you for the set, good-chap-from-Norwich. It still needs quite a bit of work to get it going, but I thought it would be fun to show the picture as it is now. 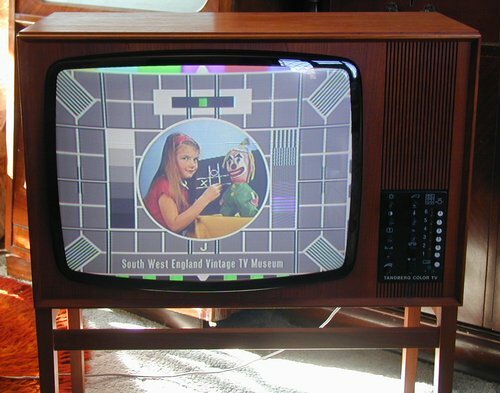 *Addendum - In October (2012) I dropped Mr Rusty-Pye on a corner after it slipped out of my hands and broke the cabinet, and the poor old thing is now looking a bit sorry for itself (the tube has flopped down inside the set). I haven't fixed the cabinet yet but I will report back here once the old monster is back together again. 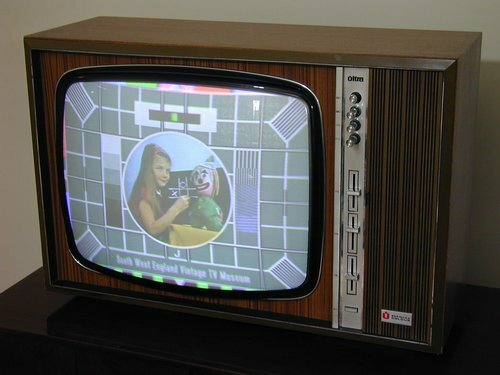 The next set, a Pye CT200 is one of those sets that probably seemed like a good idea at the time. 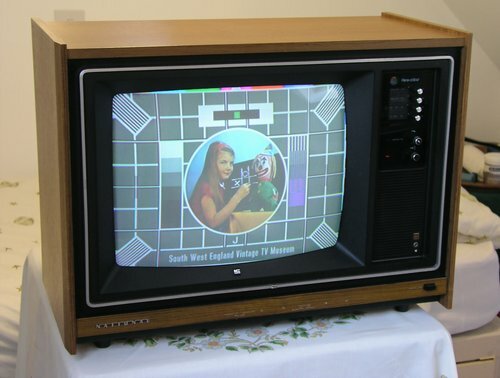 I guess it filled a gap for a really cheap colour TV to compete with the likes of Thorn and their "8000" chassis and some of the Japanese sets, but it never really worked very well. The pictures these sets produced were always mediocre at best (or perhaps I've just never seen a good one) and everything to do with high-voltage regulation was terribly poor. The pictures bounced and ballooned all over the place with changing brightness levels, and the picture always seemd out of focus on high brightness scenes. This set is an unusual model, and I've never seen another one like it. 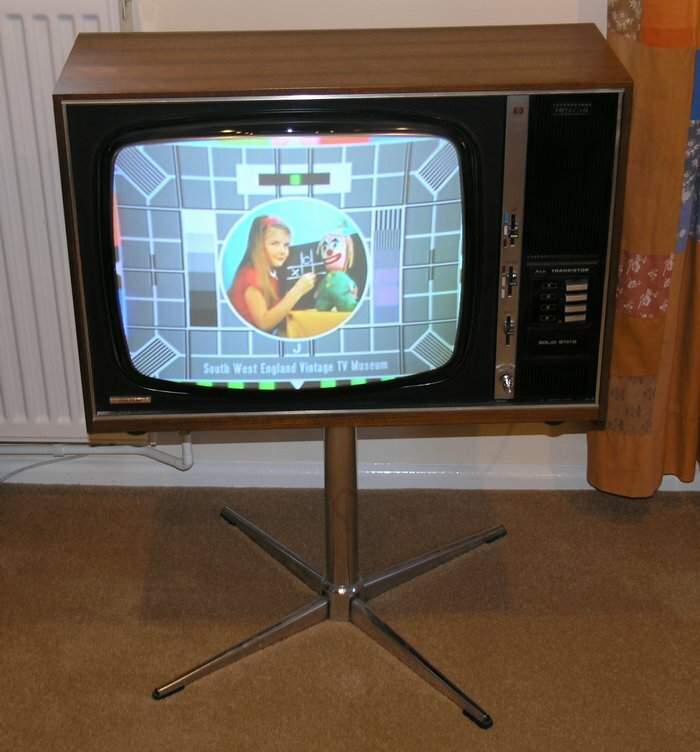 It's a Rediffusion-badged set but inside it uses the Rank dual-standard colour chassis. 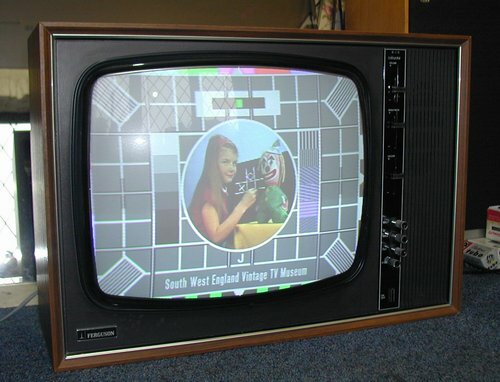 The set came from a mate of mine in Somerset and has had some work carried out, but the insulation on the primary of the line-output transformer has broken down and the set requires a new one. The tube is reasonable but not wonderful, and the set produced an "okay" picture when it was working. This RGD CR20 came from a good mate of mine up north, and had a peculiar line-collapse fault when I had the set. It uses the pretty standard KB / ITT CVC5 (I think) chassis. The set is now with another mate of mine down in Bournemouth waiting for some attention. (Description by new owner Tas S. from St. Albrans.) This Ultra 6713 was introduced as a slightly larger version of the cheap and nasty, erm I mean cheerful, Thorn 8000 17� set. It started life in Mike�s hands with a badly behaved line output fault where the line output transistor would blow after a few seconds use. Mike decided it was too new for his collection so it passed to me to knock into shape. After not too long it was working fairly well and once a particularly elusive convergence fault which was traced to open circuit red frame convergence coils was sorted out - thanks Graham for the coils - it was working even better. The Mazda tube, despite boosting quite well, didn�t last and a low focus voltage �unipotential� Hitachi tube was fitted and the set now performs very well indeed.